This property is all about location. Guests can walk to town, all restaurants, and shops, and the public beach is 2/10's mile down the street. One never needs to get in a car once they have arrived. 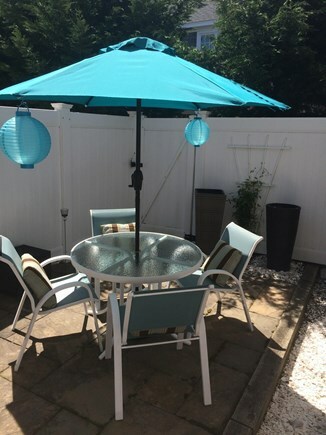 The property is in Harwich Port Village, but situated in an area that has great privacy. There are 2 parking spots designated for this property, since parking is at a premium in this area. The Freedom Ferry for Nantucket is .6 mile or 1 minute from this property. Makes for a great day trip or getaway for a few days. Harwich Port Village is referred to as a ''Happy Place''. Location, location. Chatham and all its charm is 20 minutes away. All the National Seashore beaches are all within approximately 30 to 45 minutes. The infamous ''Beachcomber'' beach/bar/restaurant in Wellfleet is a must day trip. A trip to Provincetown at the tip of Massachusetts is a great day trip with all its restaurants, shops and beaches. A very New England Beach Vacation. Additional availability info: Checkin 3:00 PM on day of /Checkout 10:00 AM last day. This is a Saturday to Saturday vacation rental. Additional pricing info: Cleaning Fees included in price, State and local taxes of 12.45% will apply. This rental property was amazing. It was like a home away from home. It had all the amenities that we needed and then some. 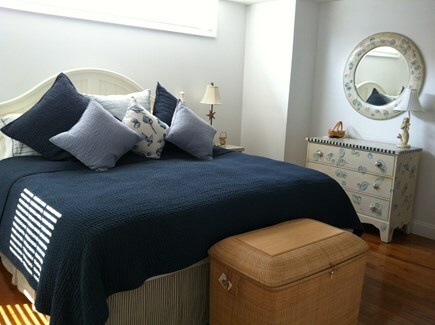 It is located within walking distance to the beach, restaurants, and shops. The property was clean and updated with everything you will need (e.g. towels, linens, new appliances, bikes/helmets, beach chairs, etc.). Sandra and her daughter went above and beyond to ensure that we had the best vacation ever. We will definitely be renting this property again! Thanks, Kristin and family! Would love to have you again! You are the perfect guests! This was the first time my husband and I used weneedavacation.com to find a rental, and it was an excellent experience! 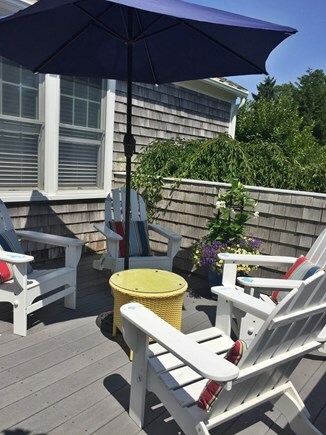 Sandra's townhouse is in the perfect location - it's quiet and peaceful yet you can walk to Bank Street Beach or to any of the little shops/restaurants downtown. We came for three nights with our three year old and this was the ideal set-up, since he naps in the afternoon, we didn't want to have to be driving to the beach every time we went (and we weren't sure how often he'd want to go!). The townhouse was also perfect - just as pictured, it has everything you need and is like visiting a friend or parents' home rather than a rental. The first floor has a great kitchen and living room, and a full bath and bedroom. In addition, there are the two outdoor areas for relaxing/having breakfast/dinner. The upstairs is a spacious master bedroom and bath. It's super luxurious, and Sandra has everything you need. Towels, beach towels, and sheets were all included, and there's a cable TV in the living room and wifi throughout. Harwich Port is also an ideal base for the Cape. We've only really been to Falmouth and P-town before, so we were super happy with this location. ~10 minute drive to downtown Chatham and ~20 minutes to Mayflower Beach or Skaket Beach (two other beaches we checked out). This property is all about location. 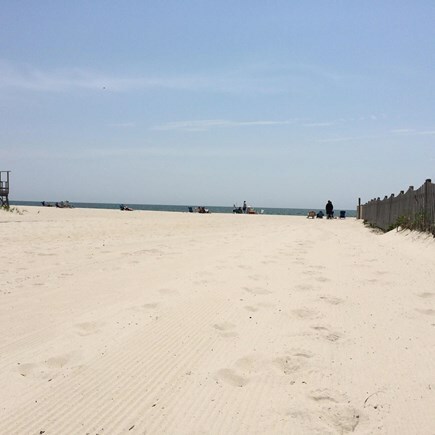 Guests can walk to town, all restaurants, shops, and the public beach is 2/10's mile down the street. One never needs to get in car once they have arrived. 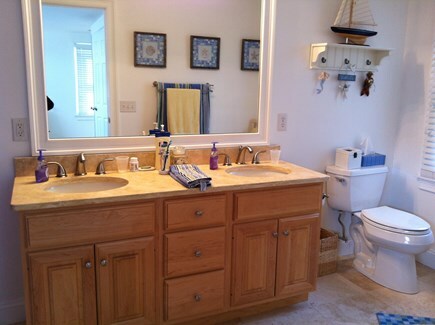 The property is in Harwich Port Village, but situated in an area that has privacy. The Freedom Ferry for Nantucket is .6 mile or 1 minute from this property. Makes for a great day trip or getaway for a few days. Harwich Port Village is referred to as ''Happy Place''. Location, location. Driving to Chatham and all it's charm is 20 minutes away. All the National Seashore beaches are all within approximately 30 to 45 minutes away. The infamous ''Beachcomber'' beach/bar/restaurant in Wellfleet is a must day trip. A trip to Provincetown at the tip of Massachusetts is a great day trip with all it's resturants, shops and beaches. A very New England Beach Vacation.